Specialty shows are restricted to dogs of a specific breed or to varieties of one breed. 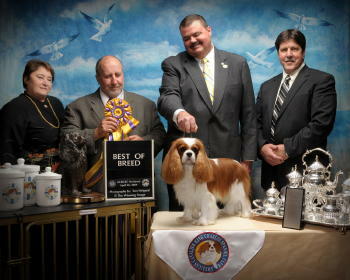 For example, the Bulldog Club of America Specialty is for Bulldogs only, but the Poodle Club of America's specialty show includes the three varieties of the Poodle - Standard, Miniature and Toy. Judges examine the dogs, then give awards according to how closely each dog compares to the judge's mental image of the "perfect" dog described in the breed's official standard. The official written standard for each breed is maintained by the breed's national club and is included in the The Complete Dog Book published by the AKC. The judges are experts on the breeds they are judging. They examine ("go over") each dog with their hands to see if the teeth, muscles, bones and coat texture conform to the breed's standard. They view each dog in profile for overall balance, and watch each dog gait ("move") to see how all of those features fit together in action. Toy - These dogs were bred to be household companions. This group includes little dogs such as the CAVALIER, Chihuahua, Maltese, Pomeranian and Pug. Local clubs will have information on training classes for the show ring, and for obedience and agility classes. Even if the show ring is not your ultimate goal, the relationship that training forms between you and your dog will be very rewarding to you both. Local clubs also have "Matches" where you and your dog can test your skill in the ring. If the grooming area is open to spectators, visit it and talk with professional groomers to get tips on keeping your dog looking his best. At each dog show, you will find vendors and information booths. Many club booths offer helpful information to the general public. Wear comfortable shoes - you'll be doing a lot of walking. Unless you bring a chair or arrive early, be prepared to stand most of the time, as seating is usually limited. If you bring a baby stroller to a dog show, be careful that you do not run over any dog's tail, and that your child does not grab or poke the dogs it can reach. Avoid having them near ring entrances, which are especially crowded. Some shows prohibit baby strollers.